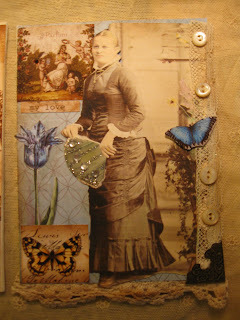 My Artful Gathering Book Pages...So far!! Hope all of you are enjoying your summer dispite the very hot temps and drought, and fires...geez it's been quite a summer huh?? What have I been up to you may ask?? Well I joined The Artfull Gathering online classes for 6 weeks and I joined Nancy Maxwell's class. We are to construct a book with 5x7 canvas boards and also a keepsake box to decorate that will hold the book we are making. I decided to make my book into a Heritage book with pictures of my Grt. grandparents from Germany, Scotland and Ireland. I am designing a two page spread for each family.